Last Sunday, Mike and Jen needed to stock their pantry with some Asian foods, so we all trekked out to do some shopping at Eden Center near Seven Corners, which has dozens of Asian grocery stores, restaurants and shops -- all in a compact shopping plaza. This place is incredible and overwhelming at the same time, especially because we happened to arrive during the Chinese New Year celebration. We picked up some pantry goods like rice noodles at the main grocery store. Tony bought some boiled peanuts at another store. We watched the New Year's dances in the parking lot - and then tried to avoid the firecrackers and their plumes of smoke. And then we stopped for lunch. Choosing a restaurant in Eden Center is particularly overwhelming. There are so many - how do you pick? We ended up going with Rice Paper, a Vietnamese restaurant, which was full of customers, so we figured that was a good sign that the food was good. And it definitely was. 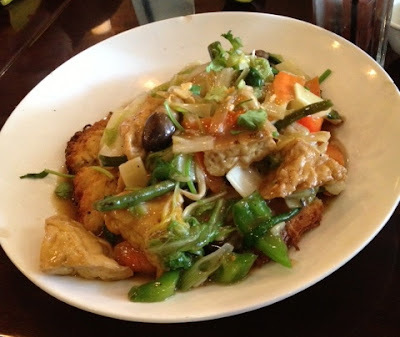 I ordered a fried tofu and vegetable dish, which had a wonderful flavor. 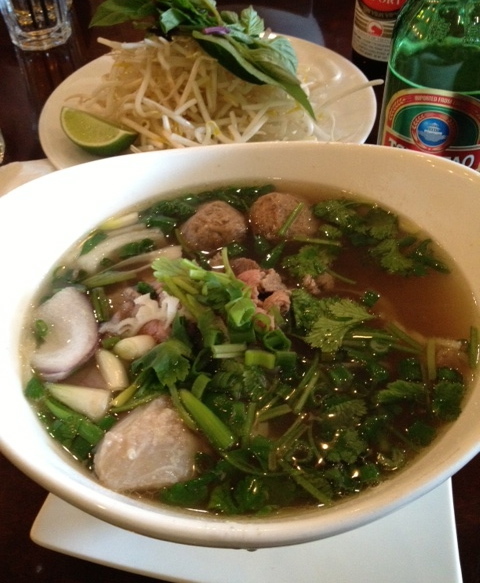 Everyone else ordered pho, and they all said it was delicious. We tried to leave after lunch, but the parking lot was a nightmare with the New Year's festivities. Mike's car was blocked in the spot by THREE other cars. So we crossed a couple of pretty busy streets on foot (Seven Corners is not pedestrian friendly) to kill some time at Home Depot, where we picked up some things for the house, including insulation pads for outlets. (More on that later.) And by the time we were done at Home Depot, the parking lot had cleared out and we were able to make our way back to the city. So if you're in the mood for some good Vietnamese food and Asian grocery shopping and you find yourselves near Seven Corners and you are in the mood to brave crazy traffic -- check out Eden Center. Copyright Jessi Zendek. Awesome Inc. theme. Powered by Blogger.